With the run for the roses taking place this weekend, I felt it only appropriate to cover the traditional drink of the derby. The mint julep is the perfect accompaniment to the most exciting two minutes in sports, but is also just as appropriate at any summer gathering. In the spirit of full disclosure, I have never been to the derby, but the coverage on the TV is very in depth and I love bourbon! As with most of the drinks I have featured the number of variations is mind blowing. I think that everyone will agree a mint julep needs bourbon, mint and sugar, beyond that it comes to individual adaptations. The mint and sugar pose the most options. My particular preference is to use simple syrup and to strain the mint. I also like bitters in mine. The funniest debate about this drink is the ice. There are more theories on the way the ice should be presented in this drink than any other I have ever researched. So to muddy the waters even more, I am inserting an additional option as my choice! The best ice for this drink is the little pebble ice that butchers put into the seafood cases. It is the perfect surface area to melting speed ratio. Sometimes it takes a little finesse to get them to hand over a bag of the stuff, but a little white lie about your grandmothers knee replacement surgery usually helps. The preparation to this drink is the key between an okay drink and an epic drink. The first step is to put your glasses in the freezer at least an hour prior to serving. Julep cups are the traditional vessel to serve this, but if your bar does not include numerous special purpose silver cups, Collins glasses work just fine. Next is the garnish, rinse sprigs of mint and when almost dry, dust them with powdered sugar. Now comes the actual construction. For each drink you intend to make, set an empty old-fashioned glass on the bar and put 1 ½ tablespoons of simple syrup in each. Then drop 12-16 small mint leaves into each glass, add three strong dashes of angostura bitters and muddle together. Pour an ounce or two of bourbon in each glass and stir. To keep with the derby theme, stick with a Kentucky bourbon, I like Maker’s Mark, but Woodford Reserve is the official bourbon of the Kentucky Derby so, at least for this week, that is what I am pouring! Next, pull your frosted glasses out of the freezer and fill halfway with ice. Strain the mint and syrup mixture into the glass and stir well. Top the glass off with ice, fill with bourbon, and stir again. Take a garnish spring and cut the stem just below the mint leave, insert into the drink and serve. Serve these with a couple of cocktail napkins to compensate for the cold and be ready for fast refills. If you have enough glasses, start each round with a fresh glass. If you make these wearing a seersucker suit or jockey uniform you get extra points! Place cups in freezer an hour before serving. Rinse and dry mint. Dust garnish with powdered sugar. Add syrup, bitters and mint to mixing glass, muddle. Stir in 1-2 ounces of bourbon. 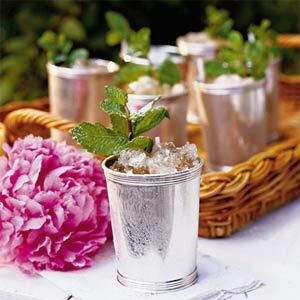 Fill frozen cups or glasses with ice, pour in mint mixture through strainer, and stir. Top with ice, fill with bourbon, and insert trimmed garnish.